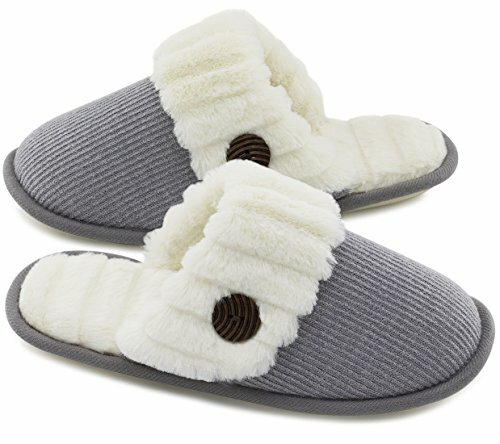 Stay cozy in style with these Knitted Memory Foam House Slippers by HomeTop - Houseshoes with a touch of loveliness, elegance and luxury. - Stylish look will beautify your house and make you home pleasant and comfortable. - Thick & breathable uppers provide ultimate warmth and comfort. - Soft plush fleece liningwicks moisture for dry, comfortable feet. - Multilayer memory foam insoles provide cushioning and shock absorption for cloud-like comfort with every step. - Skid-resistant outsoles make these slippers durable and safe to wear on flooring, carpets, tiles, etc. - Easy-on & easy-off coziness, flexible & lightweight. - Multiple color and size options, best for family use. Great gifts to give friends and family. 35-36 | US Women's 5-6 | Length: 8.7"
37-38 | US Women's 7-8 | Length: 9.4"
39-40 | US Women's 9-10 | US Men's 7-8 | Length: 10"
41-42 | US Women's 11-12 | US Men's 9-10 | Length: 10.6"
- Get o.5 size up if you are between sizes (such as 7.5, 8.5, etc), or if you have slightly higher arching feet. SIZE & COLOR - Available in 4 colors, 4 women's sizes, 2 men's sizes. Fit most standard and wide foot sizes. Great for family use.